The Suncoast KZN Yearling Sale inspections have begun with great enthusiasm this week, as 291 horses will pass through the ring on Thursday and Friday. 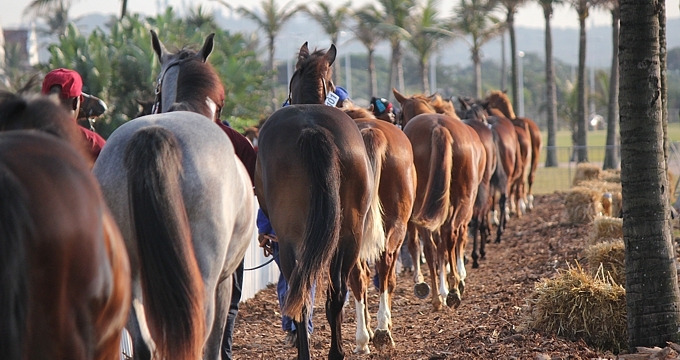 Trainers from all the over the country have been seen inspecting and after the overwhelming successes of last year’s draft and the incentive for any of this year’s draft of horses to compete for a stake of R1 million on the 2014 Vodacom Durban July day, has certainly seen many owners and trainers turning out to view horses. The sale last year has already seen the likes of graduates Gr 1 winner Happy Valentine, Gr 2 winners Virgo’s Babe (who has a half-sibling on the sale from Midlands Thoroughbreds) and Colour Of Courage (from Backworth Stud), as well as Stakes winners Jimmi Choo and Ace Antonius. Amongst the yearlings from KZN – Bush Hill Stud have a full-sibling to Tetelestai (Lot 180), Barton Hall have a super Kahal filly out of a half-sister to sire Ravishing (Lot 285), Clifton Stud have a sibling to Gr 3 winner East Beach by A.P. Answer, (Lot 195), Hadlow Stud have a half-sister to the talented Jimmi Choo named Coco Gold by A.P. Answer (Lot 143), Kinmount Stud have a full-sister to Patriotic Rebel (Lot 46), Middlefield Stud have a super daughter of Carpocrates named Lady Liberty (Lot 209), Backworth Stud have a lovely Miesque’s Approval colt (Lot 7) out of Merriment who has produced two winners to date; Piemonte Stud have a draft from a range of sires that include Trippi colt The Tripster (Lot 289), Rathmor Stud have a lovely dark-bay colt half-brother to Princess Julietta (Lot 268) and two quality colts by first season sire Strategic News as well as a Ravishing filly from the immediate family of Pocket Power and River Jetez (Lot 123). Roski Stud have a Kahal filly out of a Royal Academy mare (Lot 52), while Scott Bros have a half-brother to Gr 1 winner Orbison (Lot 158). Spring Valley have their first Fort Beluga yearlings on offer – including one out of Fancy Fantasy – a half-brother named Telemachus to Gr 1 winning Indiscreet Fantasy, Silver Fantasy and Malinga. St Helier Stud have an A.P. Answer filly who is a half-sister to Preamble – a Stakes Placed filly. Yellow Star Stud have a super bay filly (Lot 229) by Kildonan out of Fort Victoria, who has produced four runners and four winners to date – including five time winner Victory Belt. We look forward to the start of the sale tomorrow and hope to see you there tomorrow! Visit tba.co.za to view the catalogue online.